Grid style tools are quick and easy to use and understand. This makes them a great tools for beginners. The tools fit within the grid lines, and visually divides it into a 10 by 10 grid. These smaller grids are numbered 0 to 9 from east to west and from north to south. A point that falls inside a smaller grid gets the easting and northing values of the smaller grid added on the the easting and northing of the map grid. Partial grids at the edges of the map are no problem, just place the tool as if the entire grid was present. 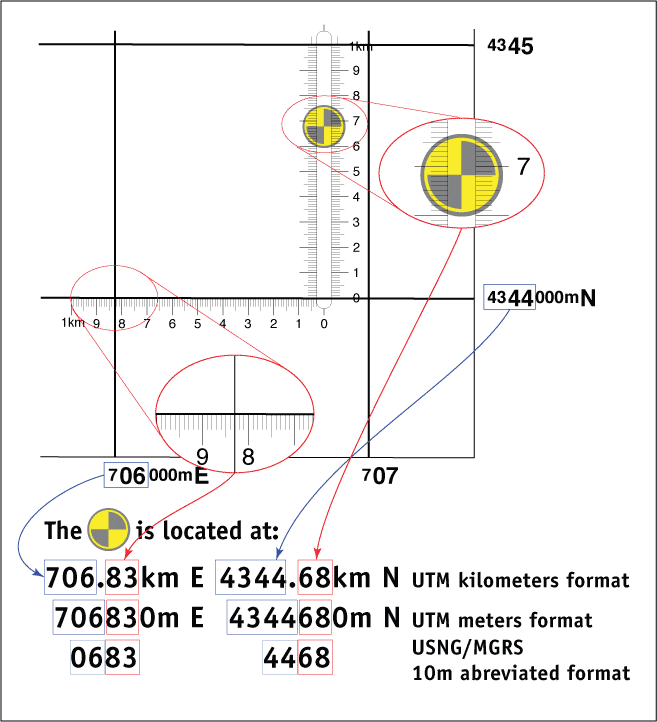 The two disadvantages of this style tool are the inability to place a mark on the map without first moving the tool. And the difficulty of determining a location with more precision that a tenth of the map grid spacing. The Slot Style is my personal favorite tool style. All the accuracy you need. Access to mark on the map. Easy to keep parallel to the grid lines. And quick to verify that it fits in the grid. What's not to like. Conceptually they are harder to understand and I often get the question, "Why is the east-west ruler numbered backwards?" The tool is used by sliding it across the east-west direction of the grid and reading the easting value at the west edge of the grid. In this aspect, it is similar to a corner roamer. The northing is read through the vertical slot, with values increasing as you move to the north. Compass rose marked in degrees. 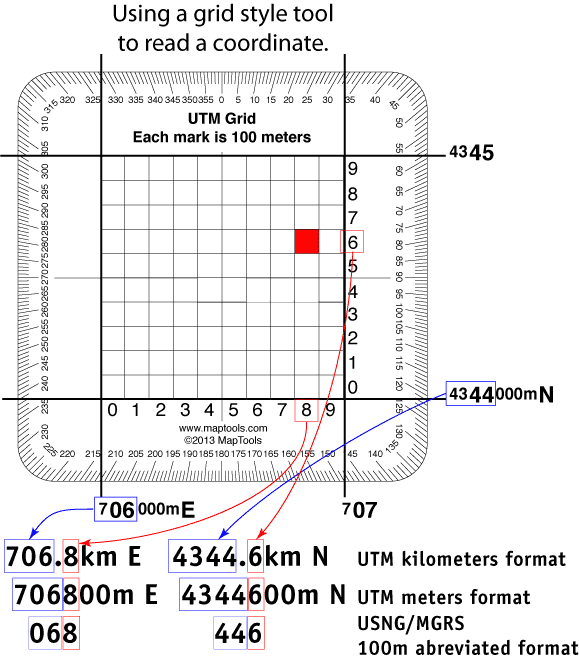 A traditional roamer tool that is used by sliding the tool within the grid and reading the easting and northing values at the western and southern grid lines. Our cutouts are in the right location. Our text is crisp and easy to read. Our corners are rounded, so the tool doesn't poke holes in you or your pockets. Our tools are printed on 0.030 in. thick stock to make them tough, with just a bit of flexibility. Our tools have a clear ultraviolet cured protective layer to keep the markings from wearing off. Our tool are made in the United States. 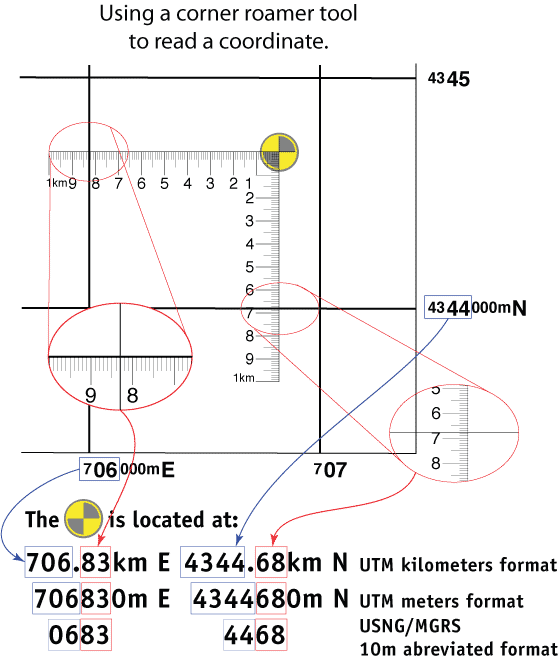 Our basic Coordinate Scale and Protractor is equivalent to a standard GTA 5-2-12. It's the tool required for most military navigation schools. Our Improved Coordinate Scale and Protractor is a popular alternative to the basic tool. Here is what we've done to make it better. We have added bands of white ink under the protractor markings. This has two benefits. First off, the tool doesn't just "disappear" when you set it down. Second, it's easier to read the angle from the protractor. Finally we have drilled a hole in the center of the protractor, so you don't have to. This allows a bit of thread or elastic to be used to extend the bearing line away from the edge of the protractor. We are able to supply our Military Style Tools in quantities ranging from 1 to tens of thousands. We accept US Government purchase cards for individuals or units wishing to make small purchases directly. We will also be happy to work with your procurement folks. If you are seeking the smallest and lightest tools, the mini corners are for you. It's just a tiny triangle that you slide across the grid. There is a lanyard hole, so that it dosen't get lost. On our most recent re-print we added a patch of white ink to our 24k, 25k and 50k tools to keep them from disappearing when you set them down. 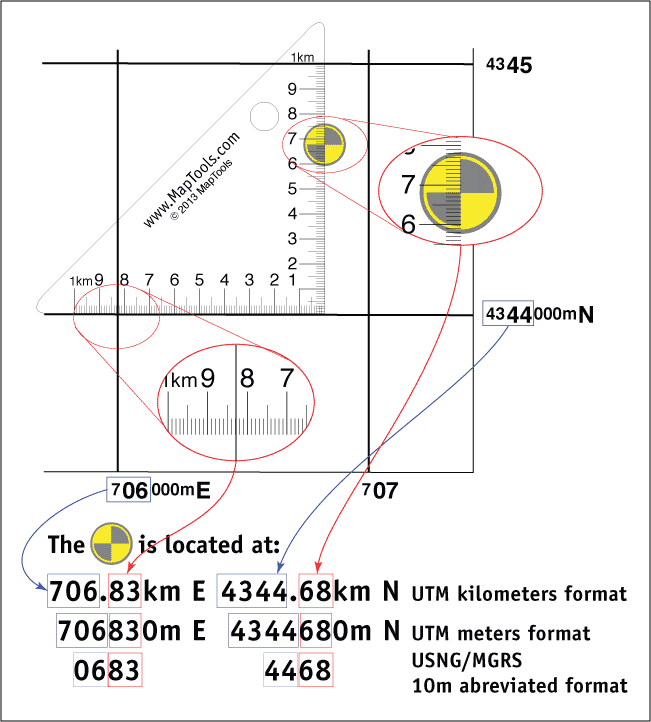 Our Map Rulers are primarily designed for plotting latitude/longitude coordinates. 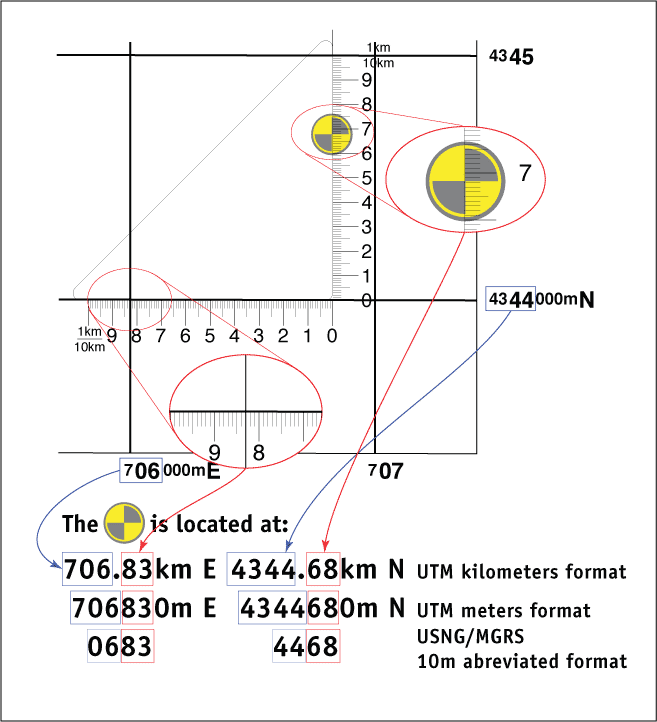 But the all have an edge marked in meters or kilometers that can be used to measure UTM, MGRS, and USNG coordinates as well. Better yet we have them for lots of different map scales.